Every year I decide to make some changes when January 1st arrives. This year I’m going to exercise more, I say. This year I’m going to read my Bible more, I say. This year I’m going to be a better person, I say. I don’t understand why we assume we have to change something about ourselves. Not that much will be different because the calendar has a new year on it, right? My friend Sarah does something that I think is truly amazing. Sarah doesn’t have a resolution each new year. Instead, she chooses one word to focus on that year. She learns more about it, practices it, and lives it out. Last year her word was RESPONSIBILITY. She decided to be intentional about being responsible in her 1. finances, 2. health, 3. rest, 4.relationships. How awesome is that??? When the year came to an end she could look back and see how she had grown in all of these areas. She still has room to improve, but it was amazing to watch her be intentional and learn to be more responsible. This year I plan to follow Sarah’s example. I want to choose a word to focus on this year, too. 2014 will be my year to SERVE. 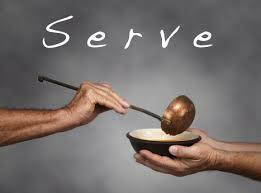 I want to serve God, serve my family, serve my family and friends, and serve my community and the world around me. I want to learn what it means to truly serve. I want to experience serving others. I’m excited for the new year! I’m anxious to learn about more ways that I can impact the lives of those I SERVE. What about you? What are your resolutions?? We’ve done this before. I think it’s a great way to set a purposeful goal to improve life in a new year. I slacked off last year but I think I’ll join you and look for a word for myself this year. Thanks! Oh Denise, I love it!!! Although I have never been one to make New Years Resolutions; this year ( while cleaning house – sweeping the kitchen floor to be exact ??!!) I had one of those God moments where He chooses to talk to you when you least expect it about something you least expect!! Make sense?? Well I felt like He was saying that this year: I should do more intentional living. Last year and maybe even the one before my number one complaint was that I would just get caught up in the day to day living ( grind to be more exact )! I constantly felt like I should be doing more but didn’t know when, where, when, how , or when……! Life is soo crazy as most of know. I would just get bogged down in the every day grunt and grind of life. Barely if at all moving forward: forward with being organized, forward with family matters, forward with serving and forward in my faith! Sooooo…..! I guess MY WORD this year will be INTENTIONAL! Sooooo…! I will get back with you an update on how it’s going! !